Nepal is blessed wit h some of the wildest and most spectacular rivers in the world. The combination of beautiful mountain scenery, exhilaration white water rapids and fascinating cultural opportunities make Nepal one of the premier places to go white water rafting. We offer fun and exciting rafting trips on the best rivers in Nepal. 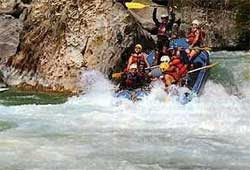 The best time for rafting in Nepal is usually September to early December and March to June. This is when the weather is best and the water is warm.